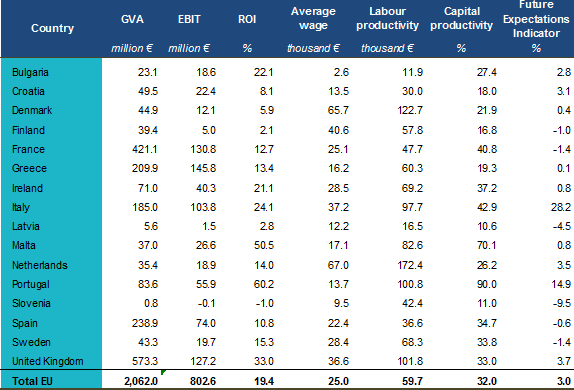 The report provides a comprehensive overview of the latest information available on the production, economic value, structure and competitive performance of the aquaculture sector at national and EU levels for the years 2008 to 2016. The EU aquaculture sector reached 1.4 million tonnes in sales volume and €4.9 billion in value, in 2016. Production has increased by 2.2% yearly between 2014 and 2016 in volume and 3.1% in value. Profit almost doubled over the same period, reaching €0.8 billion total EBIT in 2016. This marks a strong recovery from the bad year of 2013 in most of the large aquaculture countries. The EU is home to some 12,500 aquaculture enterprises, mostly micro-businesses employing less than 10 employees. Employment has remained stable in terms of total employees (73,000) but has significantly expanded in terms of full-time equivalents: from 36,000 in 2013 to almost 44,000 in 2016. This implies that aquaculture firms are providing more stable employment opportunities. This positive trend is likely to continue. With investment being significantly higher than depreciation, the sector has a positive perception about its future development. The EU aquaculture sector distinguishes three subsectors: marine, shellfish and freshwater production. With €2,731 million in turnover, marine aquaculture is the largest, followed by shellfish (€1,134 million) and freshwater (€1,028 million) production. The main species produced in terms of value are Atlantic salmon, rainbow trout and European seabass. EU production is dominated by five countries: United Kingdom, France, Greece, Italy and Spain. These countries, each with turnovers between €550 million and €1,100 million, account for roughly 75% of total production volume. At subsector level, this specialisation is even more noticeable. In the marine sector, the United Kingdom is the main producer of salmon (91% total value), whereas Greece is the main producer of seabream and seabass (47% total value). In the shellfish sector, France produces 86% of the oysters and Spain leads on mussels, covering 45% of the volume. Italy is the main producer of clams (80%). By far the most frequently farmed freshwater species is trout. Italy (19%), Denmark (17%) and France (14%) are taking the lead. Carp is another important species, especially for Eastern Europe: Poland (24%), Czech Republic (23%) and Hungary (14%). Also in terms of average wages, there are strong regional differences. The average yearly wage in 2016 was €25,000 per year, corresponding to an annual increase of 3.5% since 2014. However, nominal salaries range from less than €3,000 per year in Bulgaria to about €65,000 a year in the Netherlands or Denmark. Source: STEFC EWG on Aquaculture. Earnings before interest and taxes, or Operating profit.